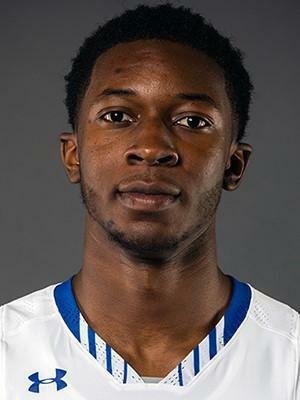 NEWARK, N.J. – Quincy McKnight (Bridgeport, Conn.), Myles Powell (Trenton, N.J.) and Myles Cale(Appoquinimink) combined for 68 points, but the Seton Hall men's basketball team fell to DePaul, 97-93, at the Prudential Center on Saturday. McKnight had his best game as a Pirate, erupting for a season-high 25 points on 9-for-11 shooting from the field, including a pair of three-pointers. The junior missed a double-double by just one assist, finishing with a career-high nine. Powell finished with 24 points, which included 4-for-9 shooting from three-point range. The BIG EAST's second-leading scorer also had six assists. Cale tallied 19 points, which included four first half three-pointers. He finished with a career-best 5-for-7 from behind the arc for the game. A jumper by McKnight put The Hall in front, 67-66, but DePaul responded with seven straight points, and a bucket by Paul Reed put the Blue Demons on top, 73-67, with 7:28 left to play. During the run, senior Michael Nzei (Makurdi, Nigeria) picked up his fifth personal foul. Trailing 83-76, McKnight drilled a three-pointer to cut the Pirate deficit to 83-79 with 4:12 remaining, but DePaul was able to stretch their lead back out on the free-throw line. Less than two minutes later, a three-pointer by Sandro Mamukelashvili (Tbilisi, Georgia) made it a one possession game, 87-84, but again the Blue Demons were able to create a cushion on the line. On three more occasions The Hall cut its deficit to three points, but weren't able to draw closer. DePaul connected on 29-of-32 free-throws for the game, including 12-of-13 in the final five minutes of the game. The game started as a back-and-forth affair with neither team grabbing a lead greater than three points for the first 8:05. Trailing 16-13, Seton Hall went on an 11-2 run, highlighted by a pair of three-pointers by Cale to put it on top, 24-18, with 11:38 to go before halftime. Down 31-24, it was DePaul's turn to go on a run. The Blue Demons scored eight of the next nine points, and a three-pointer by Max Strus tied the score at 32 with 6:20 left to play in the first half. A four-point play by Strus with 1:22 left before the break put the Blue Demons up by six, 48-42, but the Pirates closed out the first half with an offensive flurry. A layup by McKnight followed a dazzling reverse dunk by Cale to cut the Pirate deficit to 48-46. Mamukelashvili then drained a three-pointer as time expired to send The Hall into the locker room with a 49-48 advantage. Seton Hall was 32-for-59 (54.2%) from the field, while DePaul was 31-for-59 (52.5%). It's only the third time this season that the Pirates have lost when out-shooting their opponent (9-3). The Pirates were strong from three-point range, shooting 13-for-24 (54.2%) for the game. DePaul was 6-for-11 (54.5%). The Hall was soundly out-rebounded by the Blue Demons, 42-to-19, including 16-to-6 on the offensive glass. DePaul had 25 second-chance points, compared to just eight for the Pirates. Seton Hall was 16-for-24 (66.7%) from the free-throw line, while DePaul was an impressive 29-for-32 (90.6%). The Pirates forced more turnovers than DePaul, 16-to-11, which they were able to turn into 23 points. The Pirates are now 10-3 when having a positive assist-to-turnover ratio this season. McKnight finished with a season-high 25 points and a career-high nine assists. He was 9-for-11 from the field, including a pair of three-pointers. Powell had 24 points, six assists and a team-best three steals. He was 4-for-9 from three-point range. Cale tallied 19 points and made a career-high five three-pointers on just seven shots. Mamukelashvili tallied a double-double with 12 points and a team-high 10 rebounds. He also had three blocked shots. Freshman Darnell Brodie (Newark, N.J.) made his first career start. The loss drops Seton Hall to 12-7 overall and 3-4 in BIG EAST play, while DePaul improves to 11-6 overall and 3-4 in conference games. Seton Hall falls to 16-8 all-time against the Blue Demons and was swept in the 2018-19 season series. It was only the second time The Hall had lost to DePaul at home. With 24 points tonight, Powell moved past former Pirates Rimas Kaukenas and Donnell Williams into 30th place on Seton Hall's career scoring list. He also became only the 30thplayer to reach 1,300 career points. Powell's 24 points mark the 11th time he's topped 20 points in a game this season and the 19th time of his career. With 25 points tonight, McKnight surpassed the 1,100 mark for his career. He now has 1,110 points. With 10 rebounds tonight, Mamukelashvili surpassed the 200 mark for his career. This is the first time this season that Seton Hall has lost when scoring at least 75 points (11-1). Mamukelashvili's double-double is the second of his career. Seton Hall enters its first bye week of the season and won't return to action until it travels to No. 22 Villanova on Sunday, January 27. Tip time is scheduled for 2:30 p.m. ET. The contest will be nationally televised on FOX and the Fox Sports app, and the tandem of Gary Cohen and Dave Popkin will have the call on AM970 The Answer, simulcast on XM 381 and the Pirate Sports Network.